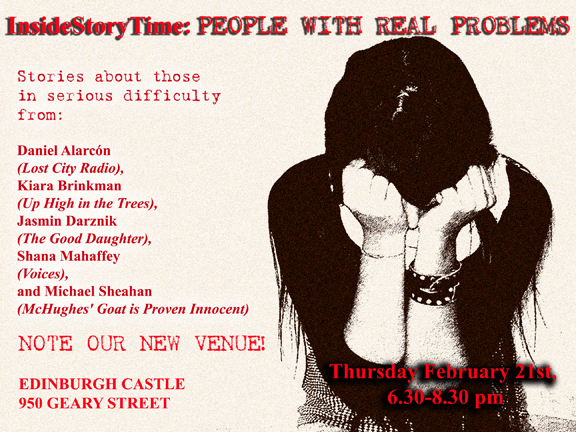 At our first Edinburgh Castle gig, InsideStoryTime's second anniversary, Daniel Alarcón read a story about Peruvian techniques for harassing debtors, and the Swedish winter. Kiara Brinkman read the story of Joyjoy and the school bus. Jasmin Darznik explored life in 1920s Tehran. Michael Sheahan gave us the scoop on 1840s Ireland. Shana Mahaffey read from “Voices,” about the difficulties of recording a script when a committee of imaginary people keep interfering.